Pasta Piatti is an Italian restaurant, conveniently located on Ashland’s Main Street. Described as “New World Italian,” I first went to this restaurant last year with my father, once in March and once, like this year, in September. The food was so good that I requested to go back this year with my family, a decision that I do not at all regret. Pasta Piatti was crowded in March, but in September evenings there are only a few people in attendance, mostly eating on the restaurant’s spacious patio. The interior, with quiet music and dark wood, made for an inviting, intimate atmosphere. A number of wines and draft beers are available; I had a sip of a tart, crisp Riesling but my tastes in wine are so far not advanced enough to give a thorough review. The first item I made sure to order was the house ciabatta ($3.50). Although dishes come with a few slices, only the whole loaf has a light brushing of oil on top, along with a salt-and-pepper seasoning that makes it one of the best breads I’ve ever eaten. As a Bay Area native and self-opined bread connoisseur, that is very high praise. For an entrée, I had the lasagna ($14.95); the cheese was sweet and as wonderful as one might expect from a restaurant in one of Oregon's prime dairy locations. I also tried the planked sockeye salmon ($18.95), which was covered in a smoky glaze that brought out the fish’s sweetness. 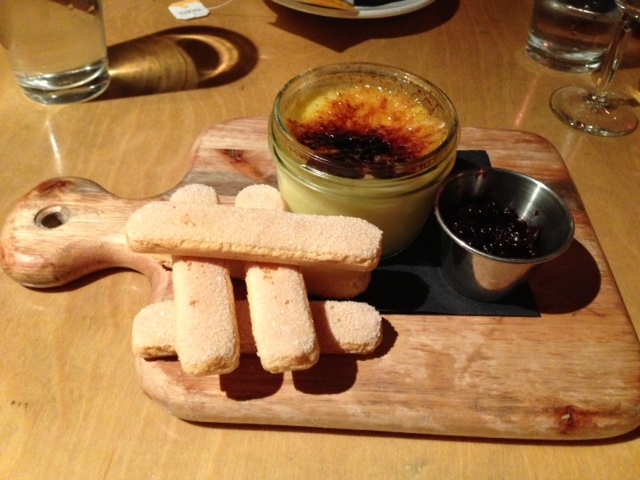 For dessert, I had a créme brulee ($6.50); it came with slightly sweet, crisp cookies for dipping and huckleberry preserves. Besides being a French dessert in an Italian restaurant, the only issue with the créme brulee was that the ramekin itself was deep but not wide, meaning there wasn’t as much crust to balance the richness of the cream. Pasta Piatti has an excellent selection of Italian food and a wonderful atmosphere. It’s a great choice if you’re looking for a nice dinner in Ashland. The extensive wine bar, beautiful terrace seating, and intimate indoor space make it a great place to go on a date as well.